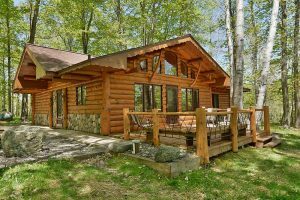 Cottages and vacation homes include a fieldstone fireplace; Cable TV, complete kitchens (equipped with all cooking utensils and basic supply of dishes, microwave, coffee maker and toaster), BBQ grill, deck and picnic tables. All cabins are located on the water with your own private pier (with the exception of the Woods View cabin which has docking available at the main lodge). Bed linens are furnished, however towels and personal items such as soap, paper products and garbage bags…are not included. What Makes Four Seasons Resort Different? Our accommodations are private, serene, tranquil and “peacefully quiet” beyond belief…we can assure that you will never want to leave the experience we provide…. Your reservation is only considered to be “secured” upon receipt of your required information, booking fee and deposit. Please check our website for minimum night stay requirements which may vary based on holidays and events. Rates and descriptions are subject to change without notice. 5% state, 4% local room, ½% county taxes are not included in the stated rates. Four Seasons Resort reserves the right to cancel any reservations or substitute rental homes due to circumstances beyond our control. Should the home selected by the guest become unavailable for any reason whatsoever, Four Seasons Resort will inform the guest prior to check in and every attempt will be made to relocate the guest to a comparable home. Booking Fee: Reservations of 3 nights or less will be charged a $27 booking fee. Reservations of 4+ days will be charged a $53 booking fee. Booking fees will be payable by credit card and will be charged at the time your reservation is made. Booking fees are non-refundable. We kindly request that you pay your deposit by check (payable to Four Seasons Resort). Please limit deposit payments to a maximum of two checks sent at the same time. No reservation is fully confirmed until we receive your deposit check. Payment: The balance of your payment is due upon arrival. Final payment can be made by check, cash or credit card. Cancellations: The purpose of a deposit is to insure the accommodations are reserved for you, the vacationer. You are responsible for the dates you reserved. NO credit will be given for late arrivals or early departures. Your deposit will be applied to the FIRST and LAST days of your reservation. To avoid any misunderstanding, you will be charged for the number of nights reserved. NEW! Cancellations must be made 30 days prior to your arrival date. Cancellations less than 30 days will result in forfeiture of your full deposit. All notices of cancellation must be received in writing for the guest’s protection. 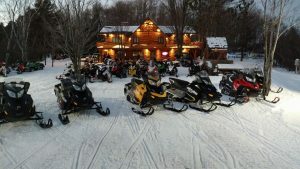 There are no refunds due to natural or man – made disaster, electrical blackouts, storms, snow blockage, road closures, lack of snow, too much snow, poor trail conditions or any other event out of Four Seasons Resort’s control. Check in is 4:00PM or later and Check Out is 10:00AM or earlier. During the summer season there are NO exceptions to this policy. During any other season, it may be possible to arrange in advance for an earlier check in or later check out time without any additional charge. Your cooperation is appreciated vacating the cottages so we can prepare for the next guest. We do our very best to have our accommodations ready by 4PM. If some unforeseen event arises that is beyond our control, there may be an exception to the check in time. Thank you for your understanding. As a special service to our valued guests, you have the first option to reserve the same property, for the same time next year (many of our guests have made their lake vacations at Four Seasons Resort a family tradition year after year in the same property). Give us a call or stop by our office, during your stay. Reservations can be made 1 year in advance. Without a booking fee and deposit, the cottage becomes open to the public for booking at the time of your departure. Each of our homes is furnished for your comfort and pleasure. Please respect and care for it as if it were your own. No Smoking: Per Wisconsin statute all of our cabins and motel rooms are non-smoking. If we find evidence of smoking you will be charged a cleaning fee of $500/unit. TOWELS ARE NOT INCLUDED in the cottages and vacation homes. However, towels are provided for our lodge rooms. Fish cleaning house is available near the dumpster. Pets are allowed at a price of $85.00 per week ($25/night from April 2nd– November 14th) and MUST NOT BE LEFT UNATTENDED IN HOMES. A $500.00 minimal damage charge WILL BE APPLIED when deemed necessary. Four Seasons Resort is one of the few pet-friendly resorts in our area. Please keep your pet under control and on a leash at all times. Please clean up after your pet inside and outside and dispose of waste properly. If you’re like most pet-owners, your pets are a part of the family, and leaving them behind when traveling can be a traumatic experience. We ask for your cooperation and compliance with our pet policies so we can continue to be a pet-friendly resort. No pets allowed November 15th – April 1st . Laws with regard to pets of the handicapped will be honored. Fireplace safety: Each of our units has a wood burning fireplace. A sample amount of wood is provided and additional firewood may be purchased from area vendors. Please do not overload the fireplace (fire marshal recommends a 3 log maximum at a time), do not remove the ashes and only have one-day supply of wood in your cottage at a time. General Information: Every effort is made to assure accurate descriptions of our properties. Four Seasons Resort is not responsible for errors in printing, changes made by Owners or matters out of Staudemeyer’s Four Seasons Resort’s control, e.g. noise, construction, weather, etc. Substitutions and refunds will not be made upon arrival for any reason except required by law. Occupancy: There are occupancy limits for each home published on our website and included in the property descriptions. Occupancy limits cannot be exceeded for any reason other than an infant. Exceeding the maximum specified occupancy breaches health and fire codes, and will result in termination of rental without refund of rent. Lost items: Remember all your belongings on your departure from the unit. Staudemeyer’s Four Seasons Resort is not responsible for lost, damaged or stolen personal items left in the unit. A $25 service fee is charged in addition to shipping costs if we are required to mail your forgotten items. Quiet Times: Guests shall comply with all laws and keep premises as clean and safe as possible. Your home is located in a residential neighborhood and quiet time must be observed after 10PM. Please respect your neighbors. Telephones: Each unit has an individual phone number and the number is available upon request. Please ask friends and family to contact you directly. There is no switch board service. No long distance calls are to be made on the telephone in the rental unit. Housekeeping services: Our units are professionally cleaned after each stay. We do not provide daily maid service. Additional housekeeping services may be arranged for an additional fee. Maintenance: Please report any inoperative equipment in your vacation home to Staudemeyer’s Four Seasons Resort immediately. We will make every reasonable effort to have the problem corrected. Every effort is taken to offer our guests a quality vacation rental experience. Thank you in advance for your comments and feedback. We at Four Seasons Resort do our very best to offer great value in our accommodations and watercraft rentals. We are sensitive to having to raise our prices and do our best to avoid doing so. However, our costs go up every day just as yours at home do – heat, electric power, insurance, real estate taxes, laundry services, licenses for each accommodation just to name a few. – Be considerate with your light usage while you are away from your cottage. Please turn off lights when you leave the cottage. – Keep your doors and windows closed while the cottage is being heated. -Place your garbage in our dumpster and remember to take all of your personal items with you upon your departure. Thank you for considering Four Seasons Resort for your next stay! We trust you’ll find one of our lakeside vacation rentals to be perfect for your next vacation. We look forward to welcoming you as a guest soon!